It’s a long story, and an impossibly convoluted one. Shortly before the real estate bubble burst in 2007, Goldman Sachs apparently collaborated with hedge fund manager John A. Paulson to assemble a package of “collateral debt obligations” hand-picked for their weakness in a housing market that Paulson predicted would collapse. 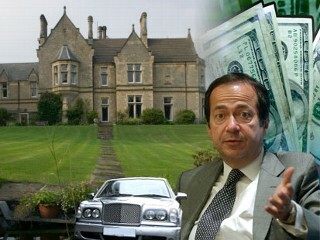 Billionaire hedge fund manager John A. Paulson: Ain't capitalism grand? The portfolio named in the lawsuit — Abacus 2007-AC1 (it sounds like some sinister c0mputer virus) — was just one of 25 such misbegotten “products” that Goldman supposedly palmed off on its unsuspecting clients. Here’s the most diabolical part: Goldman Sachs would market the doomed portfolios while allegedly betting against them. When the investments tanked and their clients (including numerous pension funds) lost their collective shirts, Goldman Sachs reaped a bundle. So did Paulson, to the tune of $3.7 billion in 2007 alone. (Yep, that’s $3.7 billion for his personal use, which no doubt helped pay the mortgage on his $41 million Long Island palazzo — with spare change for acquiring a Caribbean island or two. He made only $2 billion in 2008 — obviously an “off” year — followed by another $3 billion in 2009.) Paulson isn’t implicated in the lawsuit, because he also made billions for his wealthy hedge fund clients by having them bet against the bad securities he packaged. Capitalism is full of wonders, isn’t it? But Goldman Sachs has been caught in its own web (about time, most of us burned investors would sigh). Think of a baseball manager publicly boasting about his team’s prowess while secretly advising them to throw the World Series — and personally betting that his team would lose. Think of the 1919 Black Sox Scandal. That’s the kind of crime Goldman Sachs is accused of perpetrating. It ain’t pretty. I’d like to take a razor to Wall Street. So would several million other small investors who lost half their money in the conflagration of 2008. But as much as I enjoy my revenge fantasies (admit it: so do you), I have no intention of jeopardizing my relatively good standing with the law, an overdue $321 Philadelphia parking ticket notwithstanding. 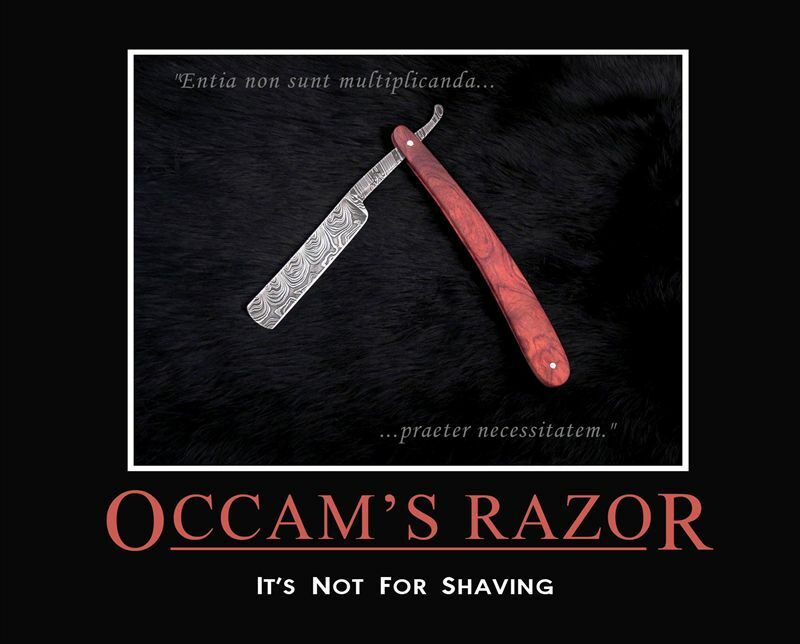 No, the razor I have in mind is Occam’s Razor, a sturdy 14th-century rule of thumb developed by a 14th-century English monk of the same name. (It was actually Ockham, but that’s another story.) Anyway, Occam’s Razor goes like this: “Entities must not be multiplied beyond necessity.” In other words, eschew superfluity and obfuscation. Strive for the simplest possible structure, because it’s usually right. Applied to the nightmarish and incomprehensible malignancy that is Wall Street today, the old monk’s adage could prove that it still has legs. When someone like Alan Greenspan couldn’t foresee the coming trainwreck, you know that Wall Street desperately needs to be simplified. If I took Occam’s Razor to Wall Street, the first thing I’d slash would be short-selling, known in the trade as “shorting.” I’d outlaw it, criminalize it and consign it to the eternal flames. Anyone who takes a short position in an investment is betting that the price will drop rather than go up. Seems innocent enough on the face of it, but look again: when enough speculators short an investment, they actually accelerate the downward drop. This is what Goldman Sachs and John Paulson did with those shaky mortgage-backed securities, the difference being that Paulson was up-front with his clients and helped them profit from the collapse. But the fact remains that in order for Paulson & Co. to win, somebody had to lose. Millions of us, as it turned out. The line between investing and gambling has always been a blurry one. I invest in companies I like, try to make a profit, and sell when I’ve amassed enough of a gain or (more likely these days) loss. But at least I invest in earnest: I want the company to succeed, and I wish my fellow shareholders equal success. In an ideal investing world, everybody wins. Unlike traditional investing, shorting is a zero-sum game: your win comes only at somebody else’s expense. Even worse, you actively root for other investors to lose. And if you have enough short-sellers on your side, you’re actually undercutting the long-term investors, causing them to lose, and swiping their loot for yourself. Capitalism, like natural selection, is a fundamentally amoral system. It matters not who’s good or kind or even brilliant — only who’s clever enough to succeed. But shorting is immoral. It helps destroy companies and wealth for the benefit of a few weasels. Wall Street needs to take a razor to it before the American people take a razor to Wall Street. Agreed that most all short-selling should be criminalized (particularly what is referred to as” naked” short-selling) and that which is allowed be subject to regulation and enhanced disclosure. If you get rid of all shorting however, you effectively rid the market of its best way to valuate shares. The whole mortgage backed securities thing was originally started by government bank mandates and interference in the housing market. I am greatly in favor of laws to keep Wall Street honest, but when you’ve got guys like Henry Paulson (no relation to John) and Tim Geithner running the show, I’m afraid we’re talking the fox guarding the hen house. Priscilla: Doesn’t the simple act of buying and selling accurately valuate shares? People buy a stock when it’s underpriced and sell when it’s overpriced: the stock finds its true value that way. Yes, shareholders lose when too many of their peers sell a stock, but at least the ones doing the selling aren’t out to gain at anyone’s expense. You raise a valid point about government interference in the housing market, though. And it’s one of those Scylla-and-Charybdis, damned-if-you-do (etc.) conundrums. Impose government pressure on capitalism (as with the high-risk mortgages) and it’s a recipe for disaster, because the capitalists will naturally compensate by creating devious schemes to profit from the imposition. Deregulate the system, and you let the robber barons run the world: $100 million golden parachutes, sinister hedge funds for the rich, absurd bonuses unrelated to performance, and so on. It’s really a dilemma: do we need more government intervention, or less? At this point I’d say we need more, at least temporarily, until we’ve established some ground rules (e.g., no shorting) that create a fairer, simpler and more transparent system. Then the system might be trusted to run itself. Re: short selling…without getting into boring stock market blather, I tend to agree with Warren Buffet, when he says that short selling can reveal problems in a company’s accounting. The whole Enron debacle was originally discovered as a result of short selling…… In 2007, the SEC got rid of the uptick rule, and, as a result, short selling could add to the downward momentum of an unstable asset…..ah, I’m already starting to blather. I’d be fine with no short selling at all, provided there was adequate transparency in the markets. Priscilla: I guess shorting is the only way to make money in a bear market, but it really crosses the line from investing to gambling (and dirty gambling, at that). The economy of the free world shouldn’t rest in the hands of gamblers… especially when those gamblers are making their money at the expense of traditional investors (like me, for example). I’ll have to read about the uptick rule as well as shorting as a way to uncover weaknesses in a company’s fundamentals. Seems like a circuitous route: how about looking at P/E ratios, market capitalization, debt, insider trading and all that mundane stuff instead? I wish I had taken macroeconomics in college. I would have lost my innocence about the ways of the world a lot earlier, probably for the better. @Priscilla, not why you should be immune to regulation, why you should be immune to hiring “market experts” to regulate former and future employers. Great……I think I’ll be more judicious in my use of the word “regulate” from now on, lol. Here’s the most diabolical part: Goldman Sachs would market the doomed portfolios while allegedly betting against them. I came to this blog via Google, and read the post before I even read the banner. But I got a good laugh from all the bluster about moderation after reading your screed. If you’re a moderate, I’d hate to meet a hothead. How does a “moderate” get so worked up over allegations? Maybe you meant to say “Here’s what would be the most diabolical part if the allegations are true.” But you didn’t say that. Instead, you rant, rather immoderately by my lights, as if the allegations are true, all the while pretending to care that they are just allegations. But if they’re only allegations, maybe you can hold your ire until they are established. I agree completely with Priscilla that naked shorting should be illegal, as should CDSs like Paulson’s where there is no insurable interest. True shorting, however, where you actually have to borrow a security and sell it in the market, is a useful market mechanism, especially under our tax system. Actual owners have both psychological and economic disincentives to sell stocks that are overpriced. So the shorts do their price-discovery job for them. Lawrence: Right and left are subjective terms, especially when viewed through extremist lenses: to a Reaganite conservative I’d seem like a socialist; to a left-winger, I’d appear to be a reactionary apologist for capitalism. (I believe in investing, after all.) As far as I’m concerned, I still have my feet firmly planted in the middle. I believe in equitable capitalism, not plutocracy (which is what we have now). We desperately need to restore some balance to a system that currently favors a handful of moneyed speculators and packagers of dubious financial products. This is why so many otherwise rational (and moderate) souls are outraged, aside from having lost half their life savings in the recent meltdown. The game seems to be rigged, and it might be time to hit the reset button. You claim that shorting helps determine the true market value of a stock. Sure it does, but so does traditional selling by investors with long positions. If I see that the P/E ratio of Google has climbed to 150, I’ll start thinking about unloading my shares. (Where’s the disincentive?) I’m not rooting for my fellow investors to lose their shirts so that I can clean up. That’s the difference between selling and shorting. By the way, I thought I was careful to describe the actions of Goldman Sachs in “alleged” terms. Yes, it still remains to be proven that they shorted the investment package they sold to their clients. But we know for a fact that Goldman shorted the housing market, reaping huge profits while accelerating the meltdown for everyone else. If I seemed to be convicting Goldman prematurely, it was probably just the heat of my rhetoric. I enjoy heated rhetoric, which differentiates me from your everyday moderate. It probably comes from having read too much Mencken in my youth. Glad you stopped by to comment… I enjoy having my views challenged. I wasn’t questioning your centrism, just your moderation, i.e., that overheated rhetoric in response to allegations. You did include the obligatory “allegedly,” but you did not respect its import: so long as these are only allegations, I think the outrage has to be conditional. There’s a bit of “We’ll give him a fair trial and then we’ll hang him” to your post. I have no problem with heated rhetoric per se – I prefer it, actually – but I only express outrage about things I believe to be true, and allegations don’t usually get me there. On the substantive question of shorting, I do not believe that traditional selling alone can get the price-discovery job done. Why are you waiting for Google to go to the sky before selling it? Do you want to avoid capital gains taxes on a lesser gain? A short seller has no such qualms. If your investment falls, do you feel no urge to hold it until it gets even to vindicate your pick? Whether or not these things affect you, personally, they do affect the market statistically. Longs are too slow to sell, which means that sales by longs do not adequately move the market to the right price. The issue is important because, as a long, I like to get bargains, and I cannot get bargains if people won’t sell their shares for tax or psychological reasons. Ironically, your qualms about shorting – because it would make you root for someone’s failure (qualms that I share, and for which reason I don’t short, either) – actually keep you (and me) from participating in the price-discover mechanism as shorts. Someone’s gotta do it, and if longs won’t for tax and psychological reasons, and hypocrites like us won’t because we feel icky about it, we should be thankful for the less fastidious players who see a mispriced asset and put their money where it needs to be. Lawrence: I used to regard “centrist” and “moderate” as virtual synonyms, but over the past few months I’ve been sliding toward the distinction you make: centrist political positions vs. moderate temperament. You might call me an immoderate centrist, then. I think I’m beginning to understand the value of shorting (thanks), although I still don’t approve of it. You believe that most long investors tend to hold onto their stocks even when the prices are overinflated. There’s a lot of truth to that viewpoint (look at the dotcom boom of the ’90s), though when you come down to it, the fair market price for any item (merchandise or stocks) is what the average buyer is willing to pay. If someone wants to pay $550 for a share of Google even with a P/E ratio of 150 (just a hypothetical figure), who’s to say that the stock is actually worth less? The price may have skyrocketed due to future earnings potential, market dominance or any number of other factors besides current earnings. Shorting will end irrational exuberance in a hurry, but it also destroys wealth (except for the shorts) and even companies. When you add the ethical factor, I think the argument against shorting outweighs the argument in favor. But it’s an intriguing two-sided argument nevertheless. Re: preview button. I use WordPress, so we’re locked into their posting mechanism. But you can easily go back and edit your comments as soon as you post them. Lawrence (again): Now I’m wondering if I can edit comments only because I’m the administrator. On my screen, every comment (even those made by others) has a little red “edit” button to the lower left. It might be that you don’t have that option. I’ll look into the innards of WordPress and see if there’s a preview option that I hadn’t noticed before. … though when you come down to it, the fair market price for any item (merchandise or stocks) is what the average buyer is willing to pay. I also think you need to distinguish between real shorting and naked shorting. Only the latter destroys companies. Real shorting is a self-limiting condition, because there are only so many shares available to borrow and sell. It’s been around for centuries and was not a problem until recently, when some technological developments made it possible, for example, to buy a credit default swap on a company’s debt and then attack it with naked shorts to cash in on the swaps. I would prefer that the regulators make the world safe for “regular” shorting by outlawing the practices that allow shorting to be abused than ban shorting altogether.